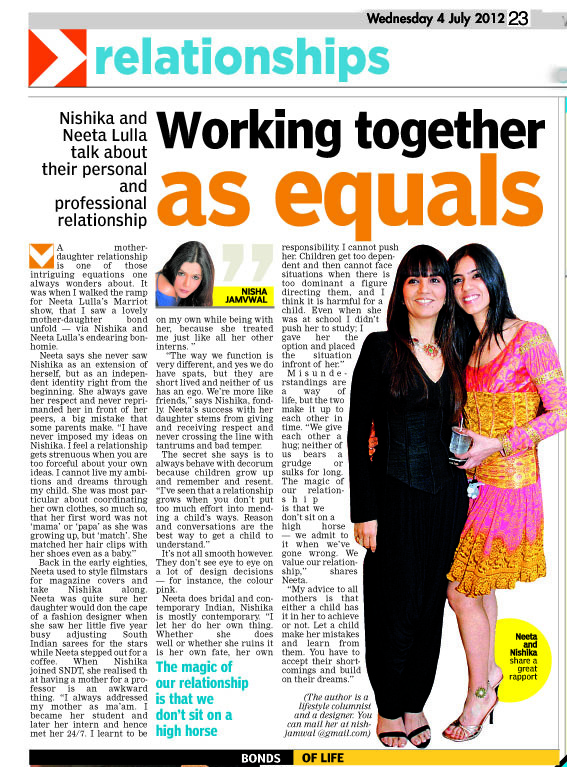 Nisha JamVwal Writes: A Mum & Daughter Working Together As Equals! How Does it Work? 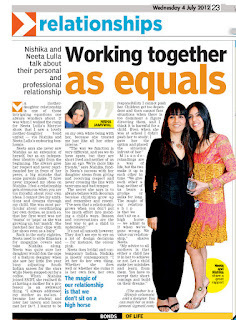 A Mum & Daughter Working Together As Equals! How Does it Work? A mother daughter is a tenuous relationship as it is, but when they work together it can be a tight rope walk I’m guessing. And so when I walked the ramp for Neeta Lulla’s Marriot show I was pleasantly surprised to see Nishika and Neeta Lulla’s bon-homos, back slapping rapport with each other, so seamless and happy- it was a delight to my surprised eyes. Back in the early eighties Neeta used to style film stars for magazine covers and take Nishika along. Neeta became quite sure her daughter would don the cape of a fashion designer when she saw that her little five year old tot, who had then accompanied her on the shoot, was busily adjusting the South Indian stars sari while Neeta had stepped out for a coffee. When Nishika grew up she knew she would be a designer and join her mother’s firm. She joint SNDT only to realize that her mother was her professor which could have been awkward. “I always addressed my mother as ma’am’ interjects Nishika. “I became her student and later an intern where I worked for my mother at which point I met her twenty-four-seven. I learnt to be on my own while being with her, because she treated me same as her other interns. So the interesting thing was that I saw her giving me space and we kept a professional distance. What is special in my memory is that even when I was very young and I was growing up, I found she was nurturing me, but allowed me to do what I wished. There was no pressure upon me to study or perform. So somewhere I became aware of the fact that I wanted to do fashion. Misunderstandings are a way of life, how do they make it up to each other. “We give each other a hug, none of us bears grudges or sulk long term. The magic of our relationship is neither of us sits on a high horse, we admit when we’ve gone wrong. We value our relationship too much” shares Neeta. A tiny word to all parents out there from me, please take a cue and be polite and kind to your kids. It is unfair to take them for granted and ride rough-shod on them. A tiny word of love to all the kids and teens out there, be nice to your parents, they are not going to be there around you forever- love them while you can enjoy them! I couldn't stop smiling and giggling while reading this.... My mother was always a strong and independant woman. Although she married very young that didn't stop her from working, studying further and helping with my dads business whilst managing two very demanding kids! I always wanted to be like her and worked in the business with her during weekends. Despite being the daughter (that too very pampered) she ensured I was never treated differently to her staff, ensuring i worked my full hours, taking the same lunch breaks, not disappearing whenever i wanted to and certainly no slacking. Of course we had our differences and arguments the way things were done but they were all meaningless and we always learnt something new from each other. I have a very close auntie in Mumbai working as a Manager in a top boutique; whenever i'm visiting from London i always try helping her out. Again at home she treats me like her daughter, but at work like everyone else I'd call her Mrs O. Making me do this showed me how hard our parents work to earn the income we take for granted and its played a big in learning how to treat and respect my bosses in other jobs. Awesome article yet again!! I think what Nisha's says (the Word 'H')is very true but most of us still just as she said; "men denies and women pretends". those who belongs to this category are hypo critic and lies to themselves. it still amazes me that most of us are still not willing to accept the truth which is so very natural and bounded in us by nature. we have a lesson to learn from the article she wrote. I agree with you'll , its amazing the way Nisha has brought out the sensitivities of such a relationship and I think more girls should look at working harmoniously with their mothers, I for one feel that there can be no greater guide and companion than your own daughter and I think Anuja and david you have said it like it is, echoing Nishas thoughts correctly and Anuja your example is also an eye opener!I like the part Anuja where you say that she too learnt so much from you.